On July 3, three suicide bombers were deployed in the city of Derna, Libya. One of their bombs was intercepted, but the other two were detonated. Several people were killed and 10 or more others were wounded. The victims included women and children. The perpetrators of the attacks belonged to the Islamic State’s arm in the country. Indeed, the three suicide bombers sought to deliver a blow to the Mujahideen Shura Council in Derna (MSC), which is, at a minimum, aligned with al Qaeda’s global network. The MSC quickly issued a statement, seen on the right, condemning the Islamic State for its “treacherous operations.” Three “mujahideen” were killed, according to the MSC. Two children perished as well after one of the three attackers detonated his bomb in downtown Derna. In the weeks since, the Islamic State has suffered significant losses in Derna. Abu Bakr al Baghdadi’s men never controlled the entire city, as some Western media outlets claimed last year. The MSC, its constituent groups, and allied organizations have long been entrenched. So, the Islamic State picked a fight it couldn’t easily win when it moved against the MSC in June. The suicide bombings on July 3 were a desperate attempt to gain some momentum, but failed to accomplish any tactical, let alone strategic, objectives. The Islamic State’s frustration with events in Derna could be heard in an audio message released by Abu Muhammad al Adnani, the group’s spokesman, on June 23. Adnani made several references to the fighting in Derna, accusing the MSC of being part of the “sahwat” and calling on the MSC’s members to repent for daring to defy the Islamic State. “While there were many reasons for the arrival of this bitter reality, the most prominent reason remains to be the undisciplined actions, Sharia-wise and rationally, by the group of the ‘Islamic State,’ which, since the announcement of the ‘Caliphate,’ has sowed corruption in all the fields, invalidated pledges, dispersed groups, and infidel-branded one who disagrees, without evidence, and shed sacred blood” AQIM’s statement reads, according to SITE’s translation. In a separate statement released on June 26, AQIM defended the Abu Salim Martyrs Brigade (ASMB), which is the strongest organization within the MSC alliance. AQIM dismissed accusations that the ASMB had acted inappropriately by guaranteeing the security of Mustafa Abd al Jalil, the former chairman of the National Transitional Council of Libya, when he visited Derna. Ansar al Sharia’s deference to AQIM on the controversy surrounding al Jalil is further evidence that the group remains part of al Qaeda’s network. In fact, it was the Islamic State’s supporters who loudly criticized the ASMB for ensuring the safety of al Jalil. But AQIM ruled that it was inappropriate to label the ASMB “infidels” because of disagreements over this matter. AQIM’s rulings have angered the Islamic State’s supporters in Libya. 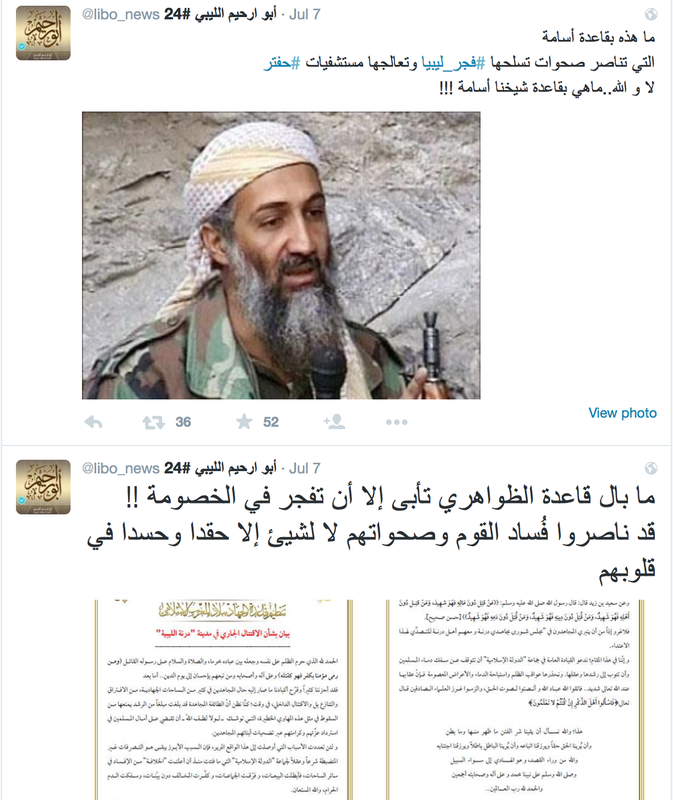 One of them, known as Abu Irhim al Libi, posted a pair of tweets criticizing AQIM on his popular Twitter feed. Al Libi argued that al Qaeda was no longer the organization founded by Osama bin Laden. Al Libi is well-connected in Islamic State’s circles, and similar anti-al Qaeda claims are frequently made by Baghdadi’s loyal followers. 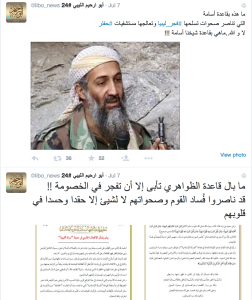 A screen shot of al Libi’s tweets can be seen on the right. The MSC continues to take the fight to the Islamic State. 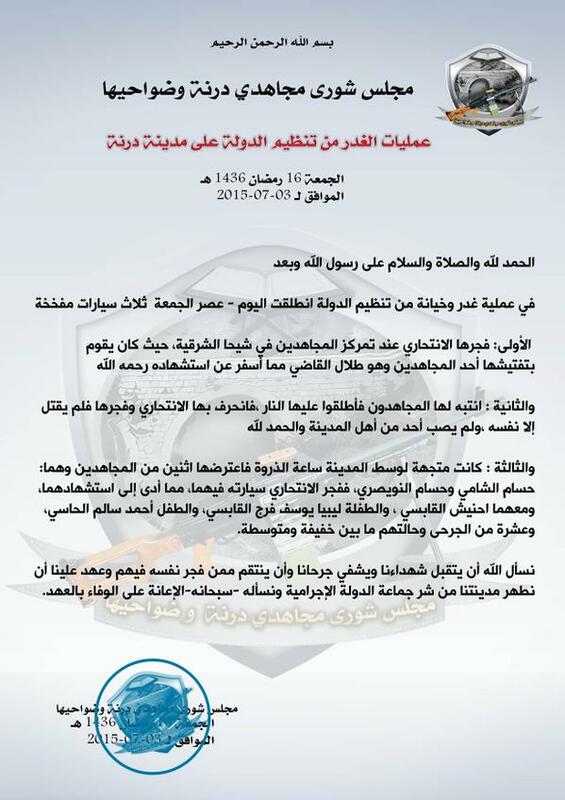 On July 6, the MSC issued a statement saying that 6 members of Baghdadi’s organization had been sentenced to death. The MSC said that a sharia court found them guilty of various crimes, including the assassinations of some of the MSC’s top leadership in June. The MSC’s decision to execute 6 Islamic State fighters is just the latest indication that things are not going well for Baghdadi’s men in the city of Derna. good stuff. At some point in time these competing Islamist’s will come to terms with each other. Based on insight provided by TLWJ & some ‘others’ it is obvious communication(s) & even cooperation/collaboration is taking place on multiple levels between the competing Islamist’s. I would suspect that elements of ISIS/ISIL hierarchy would find a way to neutralize or remove Baghdadi if an arrangement was agreed upon that supported, satisfied & or guaranteed much if not all they’ve sought & fought for. I also suspect that when such an arrangement has been ‘accommodated’ it will at least in the short term remain private(confidential?). This is what it must have felt like to be Roman and be waiting outside the walls of Jerusalem. Don’t send in any western troops as we have the libyan version of the ‘desert fox’ General Khalifa Haftar on the payroll and ready to pounce.